Congratulations you’ve made it past the GDPR compliance May 25th, 2018 deadline. But getting to this point has needed many workarounds and been expensive. The question: How do we identify and move beyond workarounds to being able to industrialize and automate governance and compliance to keep data trusted, secured, and governed and GDPR compliant? The next step in your GDPR compliance journey will be making GDPR compliance as natural part of “business as usual” — keeping you agile so when things change and, new reasons for using personal data or, new business opportunities arise your organization can accommodate them without excessive effort. In building your GDPR compliance environment you’ve gone a long way towards documenting your information supply chain and how its driving your business. 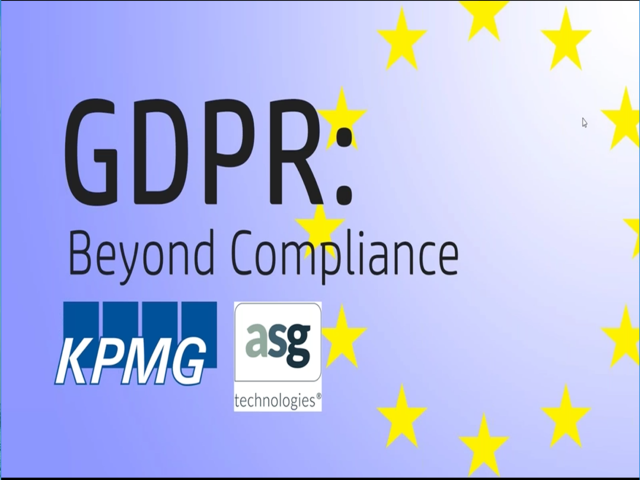 Watch Ronald Jonker from KPMG and Ian Rowlands from ASG Technologies dive into the details on how organizations are changing the GDPR narrative to drive opportunities and demand. This webinar will be hosted by the respected, award-winning journalist Mike Simons.